Mazda will be offering enhanced Mazda3 Venture and Sport Nav models starting from 1st April. The enhanced Mazda3 trio will be having additional equipments which bring extra style with no extra cost (priced from £17,495). Mazda3 is one of the highest power C-segment diesel models of any brand available. The additional equipments include 17-inch Bright finish alloy wheels, rear parking sensors, Black Mica door mirror housings and new sporty black cloth seat trim with red stitching. Along with this will also come sports styling, rear spoiler, front fog lamps, privacy glass and a rear bumper sports trim. Inside, there’s a leather steering wheel with audio controls, CD radio with Auxiliary jack and six speakers, plus TomTom satellite navigation with a 5.8-inch touch screen, integrated Bluetooth® hands -free kit, climate control air-conditioning, electric front and rear windows, automatic lights and wipers, cruise control and heated front sports seats to create a genuine premium car ambience. There are two Venture models, with 1.6-litre petrol or diesel engines, and the 2.2-litre diesel Sport Nav derivative. 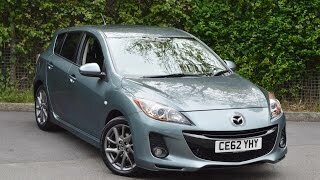 With a six-speed manual transmission as standard, this Mazda3 reaches 62mph in just 8.2 seconds, has a top speed of 132mph, records fuel consumption of 52.3mpg (combined cycle) and has a CO2 emissions rating of 142g/km.